The main concept of this project is “interactivity” with environmental parameters such as wind, solar energy, and water. 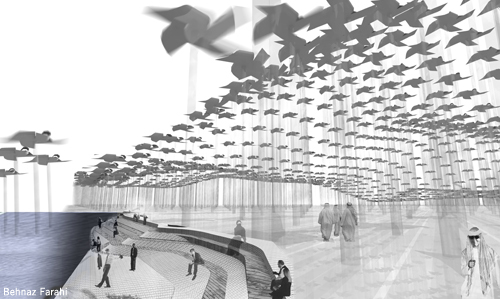 The Land of sun, water and interaction is designed by Mariyan Nasirpour and Behnaz Farahi Bouzanjani. The land is a transformative power of wind, sun and sea. In our estimation, interaction of this kind of projects with surrounding environment would provide a panoramic insight into sustainable future cities. Site of this project is located on a stretch of waterfront off the road that connects Yas Island to Saadiyat Island. In a sense, any intervention in this area takes a considerable attention to the natural parameters. Rarely a context has such dynamism and interaction between natural powers. Here should be a new concept of time, one that is ever?changing as nature. An uncertain strategy (rather than a finished composition) that responds to its context by integrating and fusing with it. Intervention must only take place to simplify actual operation of wind, water and sun. As the result of this interaction, form and function will co-evolve spontaneously resulting in mutable surfaces. This mutable surface will affect its immediate environment while it is affected by them. As a context, nature has subjective boundaries. Where sea ends green starts and where green ends soil starts. 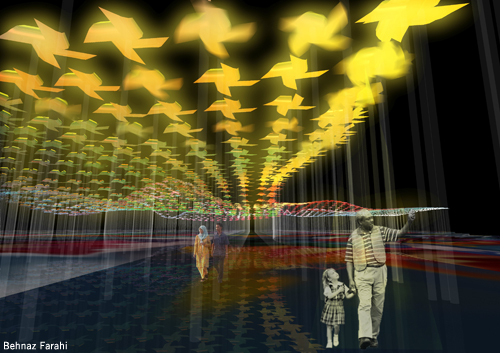 Our land-based interventions take a variety of forms and motions and cover part of whole site in colored pinwheels. This land art is composed of 20,000 colorful pinwheel modules containing motions (vertically and axially) and producing energy. In each moment in a day, according to the wind direction and its intensity, this land art transforms into a spectacle of dancing pinwheels and water. Moreover, during the day, it makes shadows underneath while converting wind power to electricity, cooling its immediate surroundings. Today I discovered that our team product for Dobai Land Generator is published in public only having one name on that project which is Behnaz Farahi. Here I am writing to advise you to correct the name of designers whenever it is published or showed. I am attaching the paper signed by me for our product publication. Designed for Site #2 in Abu Dhabi, between Saadiyat Island and Yas Island. Thanks for information. I corrected the text.